This recipe allows you to use up the over ripe bananas without having to resort to banana bread. 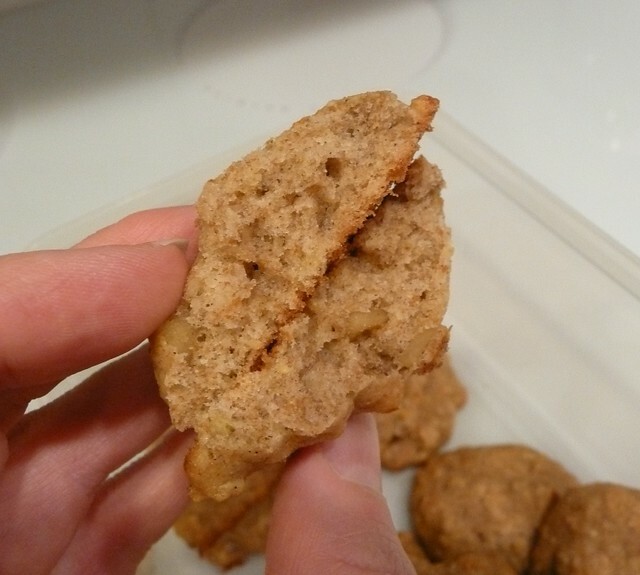 Although these taste pretty much like banana bread, but lighter, more airy. While the large amount of butter seems to make these anything but a low-fat cookie, I find that they are very satisfying so I don’t gobble down an entire half-dozen. If you break it down it is about 1/8 of a tablespoon per cookie. It is a cookie and like all cookies, they are meant to be a treat. I think that the bananas, the oats, and the walnuts add a bit of nutrients to them. I think anytime good-for-you ingredients can be added to a sweet treat it is a great thing. Homemade is better than packaged goods. Using an electric hand-held beater, mix up the butter and sugar. I mix it up until it is fluffy. Add the rest of the ingredients (except the nuts) one at a time. Blending well – using the electric hand-held beater – after adding each one and before adding the next. Stir the walnuts in using a spoon or whatever. I just wouldn’t use the beater. The “dough” is rather runny for me at this point. I use a round measuring spoon to scoop up the mixture and put it on a cookie sheet. I don’t grease the sheet, but I think that really depends on what you are baking on. You can decide. I do space them out rather far because they tend to grow a little bit. I bake them at 375 degrees for 12. I bake them for 6 minutes, then I turn the pan. And bake them for another 6 minutes, for a total of 12 minutes. Again, you decide how “DONE” you want your cookies, plus you know your oven. So maybe start out with 10 minutes and add minutes accordingly. And if you have greased the cookie sheet the time might need altering. I think I get about 4 dozen out of this recipe. I am going to keep this version of the recipe, but also do some alterations sometimes when I make them. I have some ideas I want to try. I want to try LESS butter. I also might try the chocolate chips again, but maybe less of them (I only used ¾ of a cup the first time!) and maybe WITH nuts, oh (!) and with my nutmeg addition. That might make a big difference. But I somewhat agree with my husband about adding chocolate chips to a cookie, it just makes it a chocolate chip cookie. I want to let you know the path that led me to making this recipe. First I went looking for recipes and ideas on what to do with over ripe banana and I found 100 Things to Do with a Banana (yeah, really). Since they have pictures I just scrolled through clicking on pictures I liked and it led to A little bit of this, a little bit of that . So, what do you think? Are you a chocolate lover? Then you might want to add a cup or so of chocolate chips. What else can you think of to make this better? Let me know. I am always interested in hearing about alterations. This entry was posted on August 13, 2011 at 10:55 am	and is filed under "Recipes", Food. Tagged: 100 Things to Do with a Banana, a little bit of that, A little bit of this, banana bread, banana cookie recipe, banana cookies, banana oatmeal walnut cookie, chocolate chip cookie, chocolate lover, electric hand held beater, homemade, low fat, oat cookies, oatmeal cookies, over ripe bananas, ripe bananas, sweet treat, walnut cookies, wheat flour. You can follow any responses to this entry through the RSS 2.0 feed. You can leave a response, or trackback from your own site. Please. Please. Pleeeeeeeeeaze!!! Stop writing about food…well, no, don’t stop writing about it. Stop showing pictures of it!!! OMG!!! My stomach is grrrrowling!!! Where’s that winning lotto ticket when I need it???? Pictures make it more fun! Since you have asked what I think, I want you to know I think you are awesome and amazing. All I can do is dream about the next time I have one of these cookies again. I’m sorry for eating them all the other day. When you said have one cookie, I really did think you meant one container. Since you were not very clear, I obviously cannot take blame for this but I harbor no ill will and am willing to drop the subject as long as you get me more cookies as soon as possible. I am glad you like the cookies. 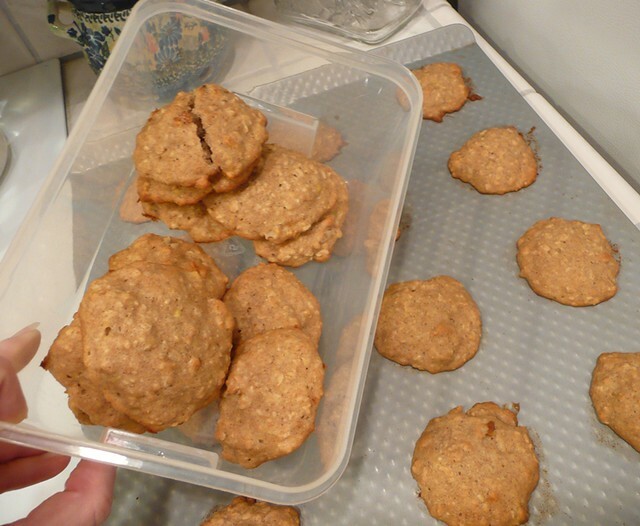 I think the oats are good for you and since I make them with whole wheat flour they are better (healthier) than other cookies I used to make. I am going to point out that YOU are the one that is tattling on himself about eating all the cookies. I didn’t say anything. I did buy bananas so that I can make more, but I AM GOING TO put nuts in them. Pecans, because that is what we have. I do like the tweaks that I have made. I know you don’t care because you have liked all three batches, but this is the one! I love you, funny man! Cookies? Yes, please. But… I have a problem with food combinations — like nuts in anything. But for you, I’ll try it! My husband does not like nuts either. But I love nuts. So he has gotten used to nuts in somethings. He is ok with them, but would prefer not to have them. But if you come to get cookies I will make them for you without nuts. I understand food combinations being a challenge. So remind me when you are here and I will make nut free things and try not to go combination-crazy on you! mmmmmm, so glad I got to enjoy your cookies – I might even try making them! thanks! They are so soft. But since your kids don’t like bananas would they just be for you? If you do make them and make any adjustments let me know how they come out.